On the last night of summer’s final youth camp, Ed Parker saw undeniable proof of the Kingdom power in church camps. He watched 29 teens signify that they felt called to ministry. "I interviewed a lot of these kids. These are quality decisions rather than just someone raising their hands in the moment," said Parker, who directs Oklahoma’s Camp & Retreat Ministries. For him, summer’s biggest challenges —floodwaters as well as no water — can’t wash away that high point of the youth camp season. The water woes slammed two of the Conference’s three camping centers: Cross Point and Egan. Some groups relocated; some cancelled. Innovation resulted in "island camps" at Cross Point, inaccessible by road for about 10 weeks due to Lake Texoma flooding. The three sites served 229 groups (United Methodist and others) in the first half of 2015. Canyon hosted 99 groups; Egan, 87; and Cross Point, 43. Parker said implementation of a new food service system saved $12,000 for Camps in that time. Also, new recipes and menus have gotten positive feedback from campers. A diner told Egan’s manager, Josh Pulver, "That’s not just the best camp food I ever had. That’s one of the best meals I ever had," Parker overheard. Now it’s time to evaluate summer’s programming for children and youth, analyze costs, and plan next summer’s schedule; to repair the dock at Cross Point, build the medical station at Egan, and add lights to Canyon’s new cross. Strong winds toppled that large cross early this year. Tweens Campers installed a temporary one. "Each camper took a turn carrying the cross up the trail. (Manager David Combs) led us in a prayer. Dean Amanda Lockwood and her staff are doing great ministry this week!" declared a June 11 post on Facebook. Then a dozen United Methodist Men of Choctaw UMC built a sturdy cross off-site and installed it in one day, using 15 bags of cement. They will treat the wood with protective sealant next spring. "Just to get up to the cross area is a challenge," said UMMen President Mike Funk. They used all-terrain vehicles to move equipment and tools over most of the route, but "we had to carry it the last several hundred yards." He added, "Guys get involved if you have projects to do." The Choctaw men also have cleared trees and made benches for seating at the cross, and built gazebos for Canyon’s pool area. They host a golf tournament to raise camp funds for kids. This summer, those UMMen supported 30 children and youth campers. Combs said Canyon guests asked "Where’s the cross?" before the replacement efforts. "Wouldn’t it be nice if we looked for it every day?" he posed. Parker said, "Our site directors do a good job of creating a culture and environment of Christian hospitality that leads people — even if they’re just there in a secular way — to experience God in some tangible way." Pastor Brett Thomasson of Madill UMC described one "island camp." Dayspring South took the plunge to stay at Cross Point. "We had a luau featuring island decorations and some Hawaiian shirts bright enough to make outdoor lighting unnecessary," Rev. Thomasson said. Camp staff and student volunteers used a dozen canoes and two power boats to shuttle the 170-plus youths and adult volunteers, as well as luggage and equipment. "Extra work in getting to camp helped bond our entire community and set the stage and tone to be open to God’s work in us," said Thomasson. "I told the campers that I’ve been a part of 23 editions of Dayspring, and the way they stepped up and opened up meant that I had never been prouder to be associated with it." He added, "John’s vision of the New Jerusalem says that its streets are paved with gold. In case the River of the Water of Life gets a little high and covers them up, we’ll have a crew ready to help out." Dayspring’s campers returned to the mainland just as the youngsters of Growin’ in Grace and Tweens Discover were arriving at water’s edge south of Kingston. At Egan on the last day of Bartlesville District Camp, youth director Evan Holmes of East Cross UMC awoke at 5:30 a.m.
"My sleeping bag had fallen half-off my bed," he wrote in the church’s newsletter. "I recalled the papers pinned to the cross, with all sorts of questions to God from the campers: ‘Why am I here?’ ‘Are you really there?’ ‘Why aren’t my parents together?’ It had been an emotional night. "What gave me the energy that morning was remembering the faces of the kids that had asked Jesus as their Savior. We ended the night watching the fireflies hum over the creek water." Holmes concluded, "You never know what God has in store for you in one week that has the capability to change your life." 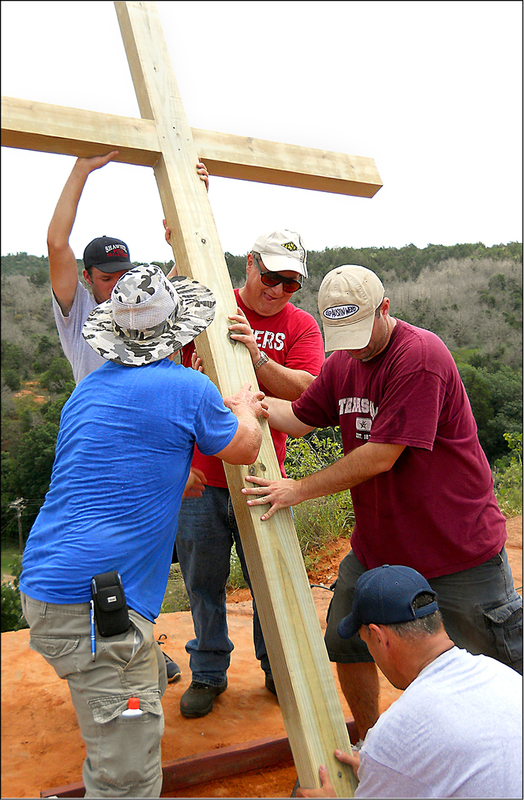 A new cross rises above Canyon through the efforts of Choctaw’s United Methodist Men. Among the volunteers were: (clockwise from blue shirt) Jerry Bower, Keipher Hotella, Kelly Davis, Charlie Parker, and Jessie Hotella. Top: teens share sunrise Communion at Egan. 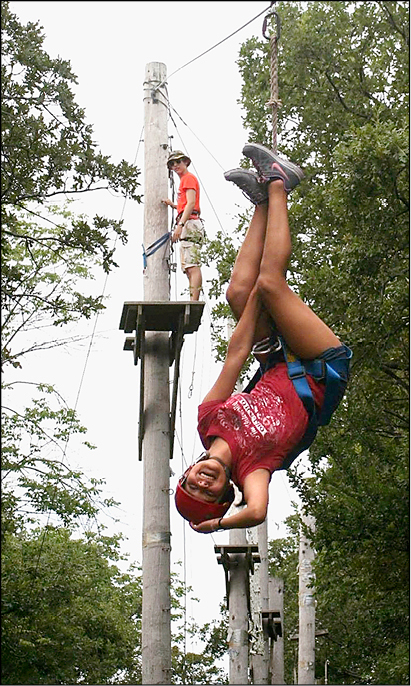 John Hiller watches a youth zip along at New Day Camp Too, Cross Point.